There's only one logical thing to do when the daytime temperature is predicted to peak at 101 degrees: Find some water. I don't mean a pool. That's for moms with their babies in the shallow end, teenagers flirting in line at the snack window, old ladies doing aqua aerobics or mid-lifers doing laps. I mean, find a nice open body of water. Sure, you may think Utah has nothing to offer in that arena. Certainly there's no way we can stack up to Idaho with its Potlatch, Clearwater, Salmon, Snake, Owyhee Payette and Wildhorse rivers. We don't have the swimming holes of the southern states, or Vermont and New Hampshire. There's no ocean, obviously, and the Great Salt Lake is, well, an acquired taste. But Utah does have water. You probably drive by it all the time. Around here, the best summer water is found in reservoirs. From Morgan to Fillmore to Vernal, reservoirs abound in this state. And while their primary purpose is to hold reserve water for residential use and irrigation, many have also been turned into State Parks (Jordanelle, East Canyon, Deer Creek, Palisades, Millsite, Red Fleet, Rockport, Starvation, Steinaker, Yuba) with recreational facilities like boat ramps, hiking trails and campgrounds. The Rock Cliff access point for Jordanelle Reservoir is only a 40-minute drive from Salt Lake City (a few miles before entering Heber City turn from U.S. 40 onto Utah 32 and travel 7.5 miles to the Rock Cliff Road). And, on a hot day, this section of the reservoir—with its lush river-bottom vegetation, cottonwood trees, grasses and reeds, fed by the ever-flowing waters of the Provo River—is an inviting sight. It took eight years to make the Jordanelle Reservoir. Construction on the dam lasted from 1987 until 1993, after which it still took more than two years for the reservoir to fill to capacity. The Jordanelle State Park opened on June 29, 1995. On a hot June day, Rock Cliff becomes my point of departure. In the 21 years since the park opened and the waters of the Provo took their new shape, this place has become a small transition area of wetland where the river meets the dammed lake. Situated in at the end of a narrow finger of water, it is a quiet, wakeless zone with little motorized water traffic. With my standup paddleboard floating at my side, I walk off the Rock Cliff boat ramp and wade waist-deep into the perfectly cool water. Setting off aboard my paddleboard, I point toward the wetland delta. I can make out a thick carpet of green algae a foot, maybe two feet, beneath the board. Periodically, denuded branches of submerged shrubs and tree limbs puncture the surface of the water. I approach the ripples where river meets reservoir as a blue heron rises lazily from its hiding place in the tall grass and makes a slow, low loop to land in a safer place farther away. Gaggles of Canada geese and their fuzzy grey young swim in and out of the reeds. Four vultures, their red heads baking in the sun, sit hunched on perches of dried wood. From the inlet, I turn west and follow the land, which changes quickly from river bottom wetland into steeply eroded walls of red sand and rock more characteristic of the rest of the shoreline and Rock Cliff's obvious namesake. The waters quickly become inky black. 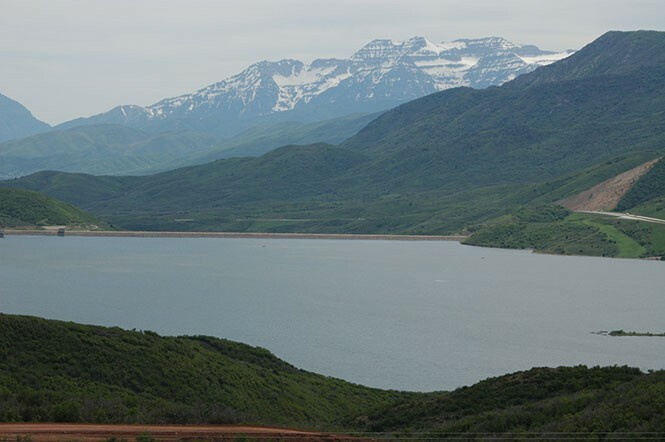 At full capacity, the surface of the reservoir—according to the Utah Department of Water Quality—sits at 6,182 feet and covers 3,300 acres in area, storing a total of 360,500 acre-feet of water. Its average depth is 109 feet, and its deepest point reaches 292 feet below the surface. Somewhere, down on the bottom, rest the remains of two small towns, Hailstone and Keetley, inundated long ago by the rising waters. Sunken ghost towns are not the kind of thing I want to think about while out on the open water and, pushing the thought from my mind, I slip off the side of my board and tread water. This is decidedly the best place to be on a hot summer day.